Former students of St. Anne&apos;s Residential School in Fort Albany, Ont., say their dispute with the federal government over disclosure of documents shows true reconciliation is a long way off. Edmund Metatawabin, 66, is one of several survivors pushing for the government to release documents they say would corroborate their claims of abuse. His own story is like so many others, but also unique. He is a success story in Fort Albany. But when he was seven, he had no idea what was in store for him. In 1956, succumbing to pressure from Catholic priests, Metatawabin&apos;s father dropped him off at St. Anne&apos;s. He was the first of 10 siblings to attend the school. He went in with his father and was sent to the bathroom while his father talked with the nun. And then he heard a door close. "I looked out the little window and saw my dad walking by, head down, looking really sad," said Metatawabin in an interview with CBC News. "I hear, &apos;Come out of there, that&apos;s enough, your daddy&apos;s not here to protect you no more!&apos; As soon as I opened the door, she grabbed my shoulder, gave me a vicious slap across the face from behind. And I hit the wall on the other side." That was Metatawabin&apos;s first impression of St. Anne&apos;s.
He says students were hit, by hand or with objects, for the smallest of infractions, or for no reason at all. One day he wasn&apos;t feeling very well. "For breakfast you got a bowl of porridge as usual. I felt sicker and sicker and finally I threw up into my porridge. And I was told go upstairs and go to bed. I was there for three days." "On the morning of the fourth day … we&apos;re now in the dining room for breakfast. And everybody is getting their bowl of porridge except me. And then I hear the sister and she came behind me … and said &apos;Here, finish that. You didn&apos;t finish it last time.&apos; And I looked at that and knew what was in there. I could see it, but I had to eat it. There was no choice." Metatawabin says a home-made electric chair at the school was used for both punishment and entertainment. He remembers that at seven years old, his feet didn&apos;t even touch the floor while seated in the chair. "There was a metal handle on both sides you have to hold on to," he said. "And there were brothers and sisters sitting around in the boys&apos; room. And of course the boys were all lined up. And somebody turned the power on and you can&apos;t let go once the power goes on. You can&apos;t let go." "And my feet were flying in front of me and I heard laughter. The nuns and the brothers were all laughing. Thought it was funny that my feet were flying around, I guess." Metatawabin says anyone who tried to resist the abuse was doubly punished. He didn&apos;t question why they were treated the way they were. It was the only school he knew. Metatawabin was there for eight years. But his summers back at home, on the land with his father, were a respite he treasured. "And one of his stories is that I would never be a trapper or a hunter. That my life would be with a pencil." His father was right. Metatawabin went to high school in Kirkland Lake, where despite being too afraid to speak in class, he succeeded because of athletics. "I learned to run. Long distance, cross country. Because I could beat the guys who were teasing me. So my body did the talking. That was my saving grace there." He went on to to university and was working on his masters degree when he was summoned back to Fort Albany to be chief. 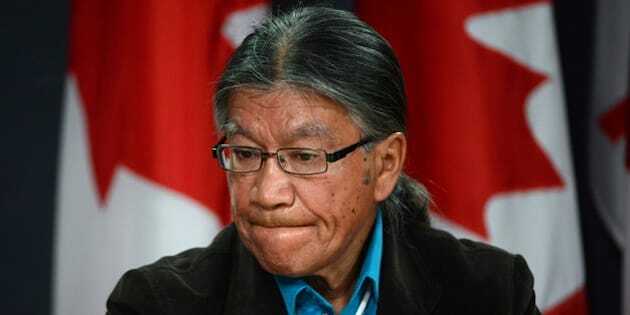 During his 10 years as chief, he organized a conference for St. Anne&apos;s Residential School survivors in 1992. He saw the suffering of people in his community and thought it was time they told their stories. Those horrific accounts formed the basis of a five-year provincial police investigation. Out of that came trials and several convictions of former staff and supervisors, including the nun who made Metatawabin eat his own vomit. Survivors say it is those police and court documents that will help back up their claims for compensation under the residential settlement agreement. At first, the federal government said that it had no obligation to get those documents for the claims process, but it turned out the government had possessed them since 2003. Metatawabin says he&apos;s tired of getting the runaround. "All we want is justice," he said. "All we want is movement that will make me feel &apos;Oh, finally it&apos;s over. Finally it&apos;s over. They believe me.&apos;"